Can you detect a teaspoon of sugar in your coffee by smell alone? Your dog can detect the same teaspoon of sugar in 2 Olympic sized pools worth of water! 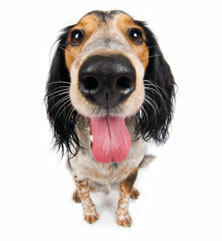 Your dog explores and interacts with the world around him through his nose. It’s been estimated that his sense of smell is up to a hundred million times more sensitive than ours. Now there is a new sport sweeping North America that celebrates the dog’s nose! The sport of K9 Nose Work is based on your dogs’ natural scenting abilities. It can build confidence, provide mental and physical stimulation and reinforce the bond between you. The best part is that it’s open and do-able for dogs of all ages, sizes and temperaments and all you need to participate is a dog with a nose! Raising Rover Nose Games class will introduce you to the sport and give you and your dog some new and fun challenges to work on together. Be prepared to develop a more profound understanding of how your dog perceives the world around him and deepen the bond between you. Nose games requires no obedience. In fact, your dog will be the expert in this arena; obedience is strongly discouraged!